I have a new obsession, heat transfer vinyl shirts. 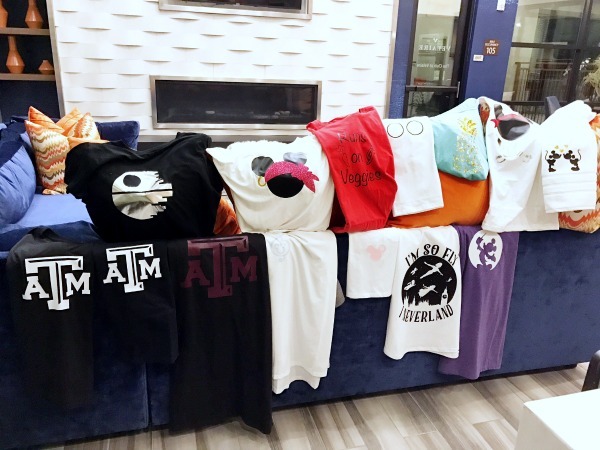 I’ve made shirts before with HTV, but now I know the secret to long lasting designs. With the help of a heat press (Thanks Ashley) and the best quality heat transfer vinyl you’ll have store quality shirts. The vinyl designs almost have the look of screen printing they are so engrained into the cotton. For this shirt I went with a garden inspired print. 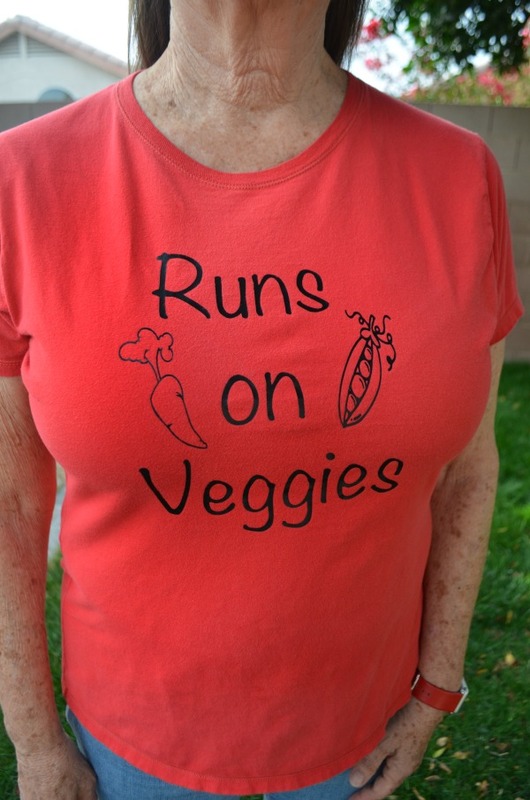 I thought the “runs on veggies” tagline fit my mother-in-law perfectly, it’s true. She wears it weekly now to the farmer’s market. 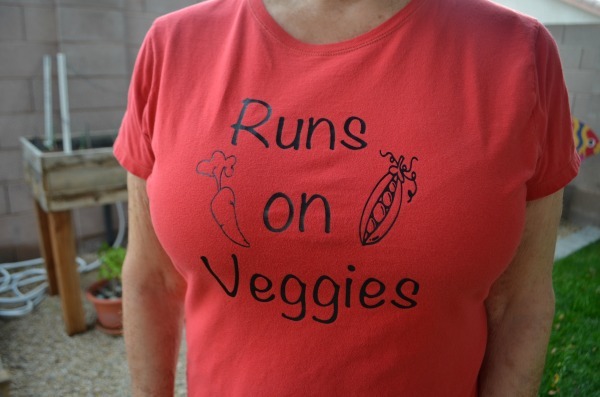 Such a fun shirt design for a gardener or veggie lover, and easy to design with the help of PicMonkey or directly in your cutting machine design software. Just find fun open-source clipart, then pair it with your favorite font. Cut out the vinyl using a digital cutting machine; don’t forget to mirror the image first. You’ll be placing it face down on the transfer plastic with the back of the vinyl facing up. Remove the negative space from your cut. Now you’re ready to prep your pressing medium. Like I said I’ve made shirts before, but they never lasted but a few washes. The vinyl and the use of a heat press are essential to making long lasting designs. For this shirt design I used black Expressions Vinyl. They have a great selection of vinyl for all kinds of projects. Keep scrolling past my tips for examples (links coming) of glitter, holographic, and glow-in-the-dark HTV designs. Use Expressions Vinyl. I’ve tried other vinyl brands and they don’t hold up as long. They crack in the wash and wrinkle easily. We’ve washed our designs several times and they still look like new. Use a heat press. You can of course use an iron, but it is the combination of heat and extreme pressure that creates a permanent design. If you are just looking for something to use for special occasions or a couple wears an iron will do the job just fine. Work with high quality vinyl like Expressions Vinyl. The material really is important as the process. Follow the precise instructions for heat settings, timing, and removal. There are some vinyls that are cold and some that are hot removal. Press the shirt for a couple seconds to remove any wrinkles and burn off sizing if unwashed. Wash your shirt inside out to prolong the life of your design. Wondering what type of materials you can press? Check your heat press for specifications, but it’s a good rule of thumb if you can iron at high heat you can press it. Like the design? Pin it for Later! Make sure to check out all these other fun designs using Expressions Vinyl from my crafty friends. You can see most of the designs below we managed to crank out in one night. 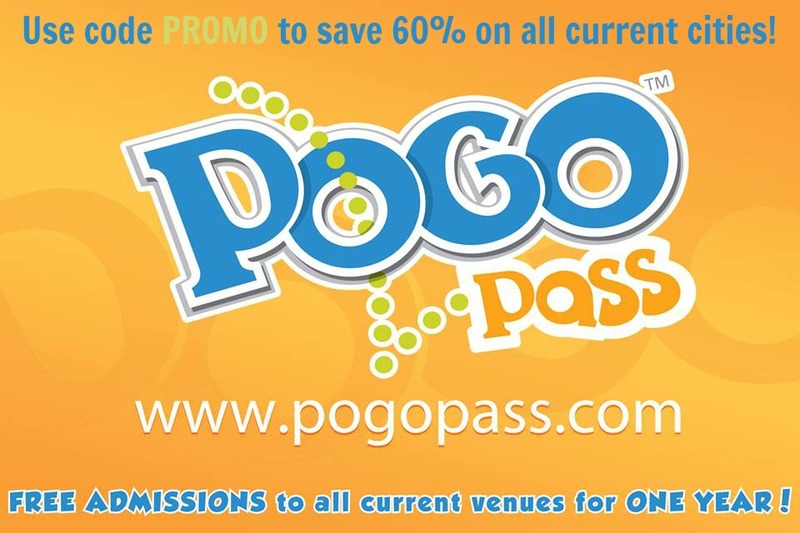 I’ll add links as posts go live. Disclosure: We were sent Expressions Vinyl to try out in exchange for sharing our experience and creativity. All thoughts and opinions are my own.